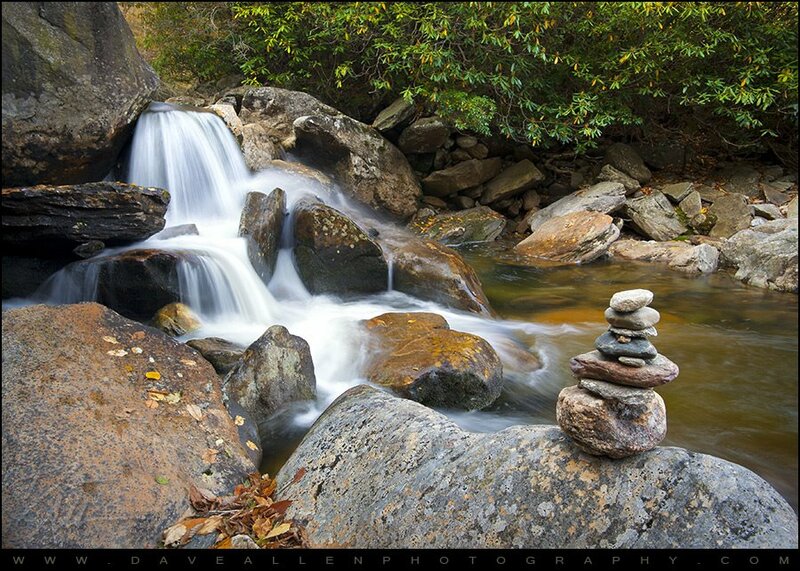 September 30, 2012 by Anthony Palombo, D.C.
Life flows from above, down, inside, out, like this cool, clear mountain stream. This graphic by artist David Stefaniak depicts the young thymus gland inside the upper chest cavity. 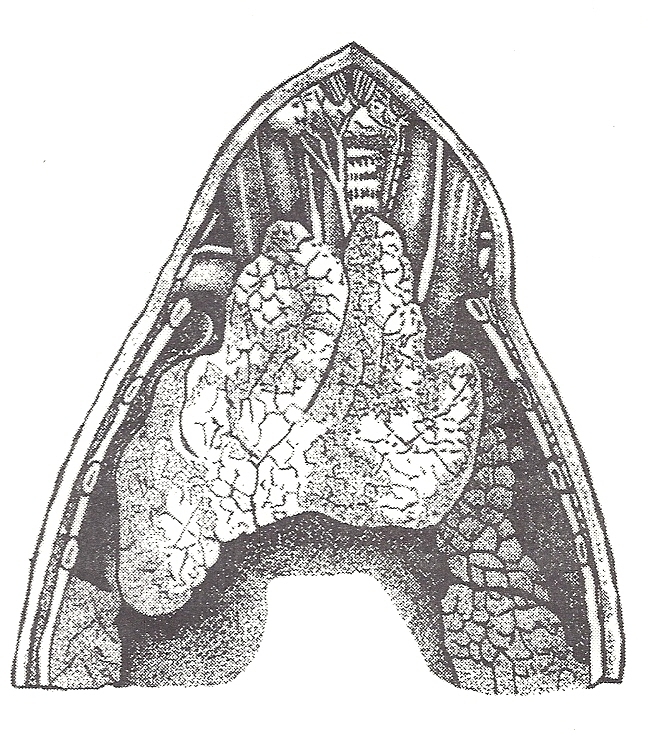 (Click on it to enlarge) Variously called the “angelic gland” in Gray’s Anatomy, the thymus is rather large up until about the age of puberty when it shrinks allowing the guileless child to lose its angelic quality as it matures so that it can live in the coarser “fallen” world without being crushed. The T cells of the thymus gland migrate to the marrow of the long bones where they will perform their roles ruthlessly defending the body temple from invaders up until the “golden years” (around age 70) when they migrate back to the chest to reconstitute the thymus gland. Shakespeare poetically describes this “sixth age” of man as the age of “second childishness and mere oblivion. Sans teeth, sans eyes, sans taste, sans everything.” Everything, that is, except sweet memories of years gone by, some perhaps not so sweet. The elderly regain that golden glow of childhood as their carefree spirit shines through their countenance once again and they return to their childlike innocence and playfulness, coupled with a certain gained sense of assurance about who they are and why they are here. Assurance is the gift of the Spirit of Purification given freely through the Thymus gland, a gift that we would do well to receive and nourish for ourselves, as well as accommodate in our elders rather than deprive them of their usefulness as wisdom bearers for the young. Young people belong with the elderly, and in some cultures this is their traditional way of life. Assurance comes through purity of heart, and the heart is purified by love burning through it. For one to reach the Golden Years with a purified heart—or any period during spiritual maturity—is a wonderful blessing, for the pure in heart see God in everyone and everything. The Thymus gland—a large, flat grayish structure located just behind the sternum (breastbone) and in front of the heart, like a shield protecting this vital organ—plays a key role in the process of distributing nutrients and elimination toxins. Here is the heart of what is referred to as the “immune system,” situated at about the level of the paps on a man’s chest. In the context and order of the frequencies in the light spectrum, it would radiate a wavelength of yellow-gold with a vibratory pitch correlating with C Natural. 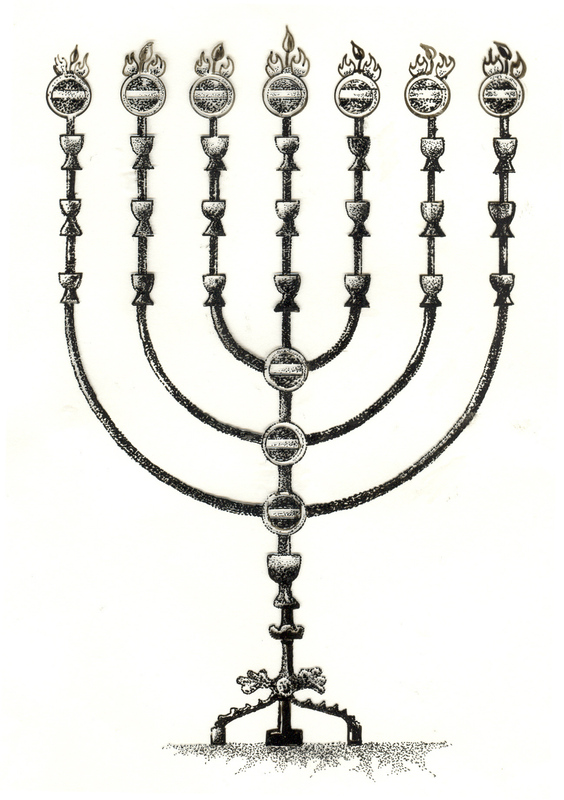 In the Book of Revelation, John describes the One in the midst of the seven golden candlesticks as being “…girt about the paps with a golden girdle.” This area would include the entire upper thorax contained within the rib cage—the lungs, the heart, the thymus and spleen, and the solar plexus. This entire section of the anatomy is taken up with activities relating to circulation, purification and ascension. The golden glow of love fills this area with substance so that these activities are carried out as gently and painlessly as possible. The Thymus accomplishes its tasks largely by way of the lymphatic system. The function of the lymphatic system is to pick up the excess fluid and metabolic waste between the cells and tissues, destroy what does not belong in the body and put it all back into circulation through the bloodstream. Much like a cleanup crew on a construction site, lymph brings building blocks of nutrients to the cells and distributes lymphocytes (white blood cells) throughout the body to destroy pathogens as it sweeps up and carries away the metabolic waste. There are some 75 million on these lymphocytes at work among the approximately 75 trillion cells in the body temple. Having no pump to move it, as does the bloodstream, lymphatic fluid depends on the movement of muscles for its circulation. Exercise, especially brisk walking and rebounding, helps to move this fluid around throughout the body. The Thymus gland is the control center for the sizable electromagnetic energy of the heart. It is with this energy field that the body maintains its integrity and protective hedge. Although we speak of an “immune system,” the reality is that the body does not have an immune system in as much as it is an immune system in its functional totality, considering the vast distribution of lymphocytes throughout the body. Systems such as the skeletal, respiratory, reproductive, endocrine, central nervous system, and others are complete functioning systems with a clear set of organs and responses. Our “immune system” may best be described as an immune alliance between various systems and organs which, when coordinated by the brain, give an immune response to the presence of any and all non-self elements and associated dis-ease factors that are not a natural part of the internal landscape of the body. These words from Revelation refer to the Holy City, the New Jerusalem, that comes down from God out of Heaven. The human temple of the Living God was designed to be the means by which the Holy City and New Jerusalem should come into the world. The words “City” and “Jerusalem” here stand for a state of consciousness. The seat of consciousness in the body temple resides in the brain. Therefore, the brain was designed to be well protected by the Spirit of Purification which dwells with the Thymus gland and employs the immune system of the body temple to keep toxins from entering the inner sanctum of the brain. Here in the cranium, as we saw in the first two parts of this series, is where the Spirit of Love and the Spirit of the Womb work their sacred alchemy through the Pineal and Pituitary glands bringing forth the Spirit of Life through the Thyroid gland in the throat. The Thymus gland is the fourth of the seven endocrine glands. This was the original divine design from the beginning: that no defilement, abomination or lie should enter the holiest place in the body temple. That design, of course, has been thwarted—the integrity of the inner sanctum compromised—by the self-serving human ego that has usurped the throne of deity in the human temple. What we now have in the Body of Mankind is an immune system that has been weakened and compromised by the absence of love in human expression and activity. Fear has chronically infected the human heart shutting down the Body’s immune system. Disease and death are everywhere at hand. Nevertheless, the Divine Design remains, as the Creator stays with his creation for as long as it exists and continues to make love available to it. Fear needs to be cast out of the heart and soul of Man. Only by perfect love can this be accomplished. Perfect love is a fire that burns away the bonds holding the heart a prisoner to fear. Fear is a darkness. It is nothing. It is the absence of light. It is faith in evil. Fear has cast a shadow of disease and death throughout the third dimension of the material world where the human species hangs by a thread over the abyss of impending extinction. But the Earth has not been detained in its renewal and transition into the fourth dimension presently underway. Ascension is in progress—for the Earth and for Mankind. The fourth dimension is characterized by the purifying and transforming fire of love. It is where the Spirit of Purification wields the flaming sword that keeps the way to the Tree of Life in the fifth dimension, and no soul can get past this Angel and partake of the fruit of the Tree of Life without letting go of fear and embracing Love utterly and without reservation. Every soul is important to the larger scheme of things and is loved more than anyone can imagine. You are loved beyond your wildest dreams. Let you love light shine without condition or concern to be loved in return. It is we who are in need of returning love to the One who has loved us first and from all eternity with a greater love than we could every muster in our human hearts. The Spirit of Purification works at this fourth vibratory level in the body temple to guard the sacred space of the upper region in the cranium and keep anything from entering here that would defile or in any way hurt this sanctum. The golden essence of love’s light is constantly intensified and clarified in order to assure a pure-hearted expression of creative power. Thus the color gold was seen by John in the region of the paps of this one like unto the Son of man. The only thing standing in the way of attainment in Fourth Plane Being is the veil of the heart which connects the third level of being with the fourth. This veil has become laden with the residue of past experiences, both individual and collective, so that it has taken on a dense, opaque texture and consistency. To enter in here this veil must be pierced—or, as in the Master Jesus’ experience, “rent in twain,” through forgiveness and utter abandon to the will of the Father. He left the third and entered into the fourth dimension of being, passing through the veil of the collective impure heart. But he didn’t stop there. He went all the way to his Father in the Seventh Heaven. Waiting on the other side of the veil, in the fourth dimension, is the incarnate angel, the One I Am, standing in the midst of the seven golden candlesticks, one’s true identity. Visit my HealingTones.org blog for an interesting exploration of Pyramid Power. I welcome your comments on the topics of my blogs. ALBANIA, ARGENTINA, AUSTRALIA, AUSTRIA, BAHAMAS, BANGLADESH, BARBADOS, BELARUS, BRAZIL, BULGARIA, CANADA, CHILI, COLOMBIA, CROATIA, CZECH REPUBLIC, ECUADOR, EGYPT, FINLAND, FRANCE, GEORGIA, GERMANY, GREECE, HONG KONG, HUNGARY, ICELAND, INDIA, INDONESIA, IRELAND, ISRAEL, ITALY, JAMAICA, JAPAN, LATVIA, LITHUANIA, KUWAIT, MEXICO, MALAYSIA, NETHERLANDS, NEW ZEALAND, NORWAY, PAKISTAN, PANAMA, PERU, PHILLIPPINES, PORTUGAL, PUERTO RICO, ROMANIA, RUSSIAN FEDERATION, SAUDI ARABIA, SERBIA SPAIN, SINGAPORE, SLOVAKIA, SLOVENIA, SOUTH AFRICA, SYRIAN ARABIA, REPUBLIC OF (SOUTH) KOREA, SWEDEN, SWITZERLAND, TAIWAN, TANSANIA (UNITED REP. OF TZ), THAILAND, TRINIDAD AND TOBAGO, TURKEY, UNITED ARAB EMIRATES, UNITED KINGDOM, USA, VENEZUELA, VIET NAM, ZIMBABWE. Welcome Viet Nam visitors! And Panama!